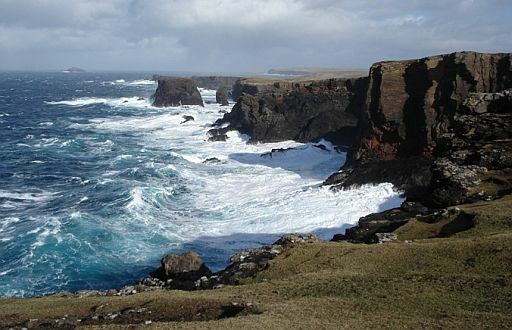 Waves that have a lot of energy are able to erode the land at the coast. This is the power of the waves crashing (brekend) against the cliffs. and longer until pieces of rock break off. 2. Abrasion: (= abrasie) ( abradere = afkrabben). off. (It is sometimes described as sandblasting). dissolving minerals in the rock. up by other waves and used to abrade the cliff even more. • Fig: Hydraulic action of waves. vormt zich daardoor een brandingsplatform. 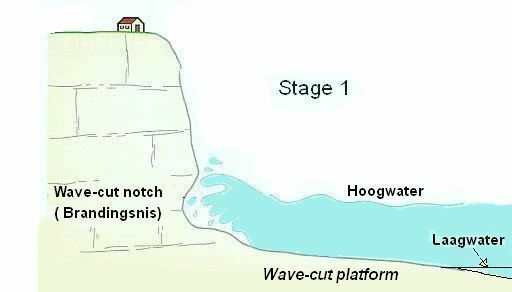 .. brandingsplatform ( Engels: wave-cut platform ) ontstaan. • Bij laagwater valt het gedeeltelijk droog. 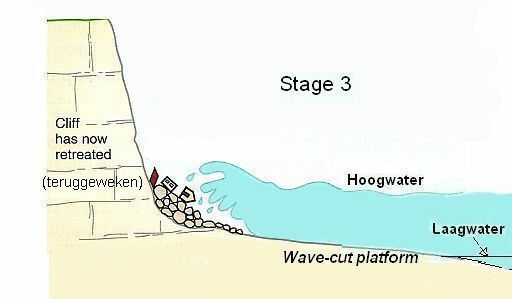 Sedimenttransport evenwijdig aan de kust vindt zowel plaats over de zeebodem als over het droge strand. langs de kust; op het droge strand door de wind. ........... When a wave breaks near the shore and runs up the beach. ........... When a wave runs back down the beach into the sea. at an angle (= scheve golfoploop) (see fig. below) . and takes them up the beach (point B). (volgens de grootste hellingshoek, dus loodrecht op het strand). where it loses energy (point C). them down the steepest slope (to point E). In this zizzag way sand and shingle are transported along a beach. The process is called longshore drift (kustdrift) and it takes place in the direction of the prevailing wind. .. of the prevailing wind. .. while the backwash ( golfterugloop ) only carries material down the beach. mean that the land will eventually disappear. .. cannot transport all the material they are carrying. ............................... between the high and low tide marks. • De tekeningen hieronder tonen de situatie bij hoogwater. .. Bij laagwater valt het brandingsplatform gedeeltelijk droog. In places where high land reaches the sea, cliffs form. .. of them, called a wave-cut platform (= brandingsplatform). • The type of rock and its hardness will dictate the angle of the cliff. ..(schuiven af) when they are undercut by the sea. ............ • Fig. 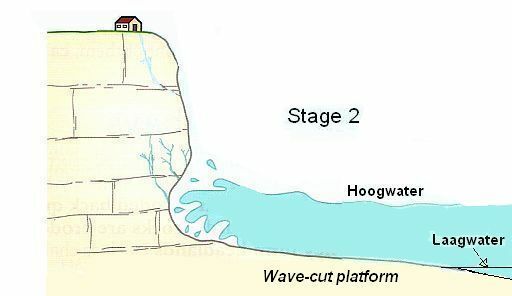 Stages in cliff erosion. • Happisburgh, Norfolk: one of the fastest stretches of eroding coastline in Britain. 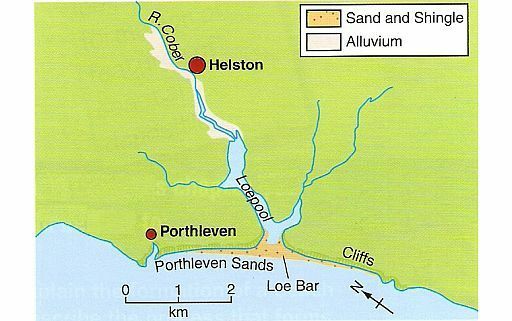 • Erosion is a problem where homes are close to the cliff edge, for example at. 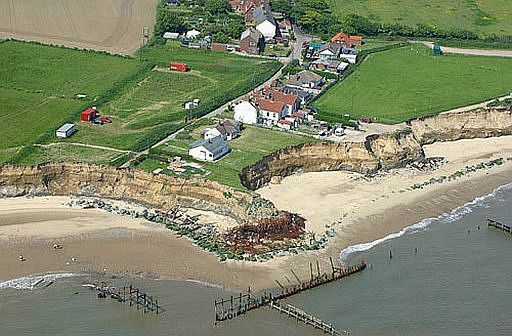 .. Happisburgh.. Sea defences can be used to protect these areas. 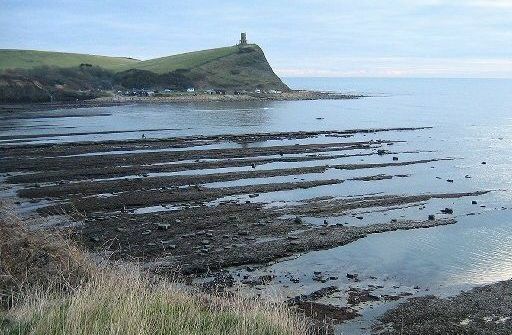 • Kimmeridge Bay met haar wave-cut platform (= brandingsplatform) bij laagwater. than they can erode more resistant ones. coast with alternating bands of soft and harder rock. ................. a rock made up mainly of calcium carbonate. ................ huge beds of chalk. .................................................. the softer rocks bays with beaches at their back. ..• In dit kaartje gebruiken we hard en soft in relatieve zin. .... hard,. maar t.o.v. het veel hardere graniet en gneis zijn ze zacht. .... Zacht ( zand en klei); middelhard ( kalksteen en zandsteen); hard ( graniet en gneis). erode first the weakest parts of the headland. These are the places where the cliffs have cracks (= scheuren). (= brandingsgrot) forms (stage 2). 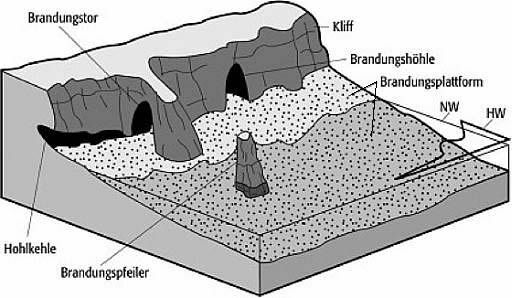 called a sea stack (= brandingspilaar; klip) (stage 4), which will itself eventually collapse. ................................... which has been isolated by wave action. back and the coastline becomes straight again. 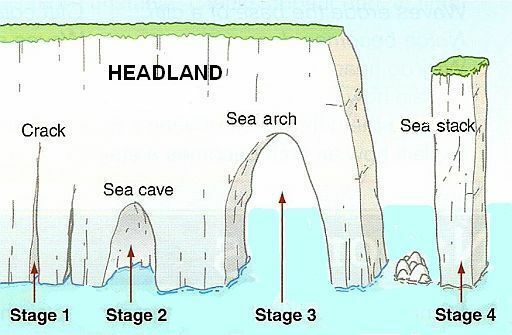 • Fig: Stages in the erosion of a headland (= kaap). typ in het zoekvenster: Brandungsformen. Klik vervolgens in de Suchergebnisse op Brandungsformen. .. which shelves downwards (= geleidelijk aflopen) towards the sea. 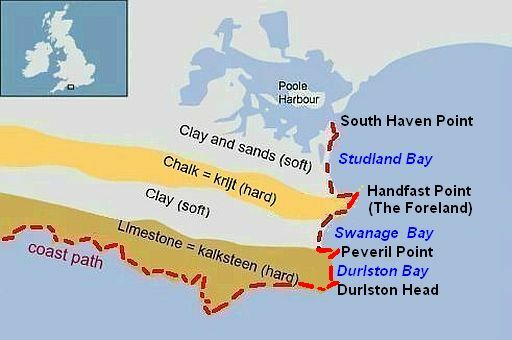 .. the shingle (kiezels), sand, silt and mud that they have been carrying. .. cliffs. and then broken up into smaller pieces and rounded off. .. longshore drift. (= kustdrift). The swash ( golfoploop) carries particles of all sizes up a beach. When the backwash ( golfterugloop) returns to the sea it loses energy travelling down a gentle slope. 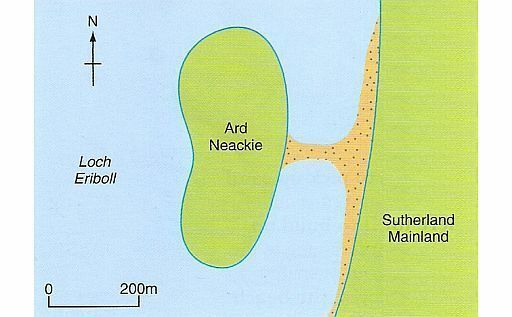 .. might only deposit shingle ( kiezels) before reaching the sea. .. not only shingle, but also sand, silt and mud may be deposited. ........• Fig. Section across a beach. ............. - smallest ones (mud and silt) next to the sea. 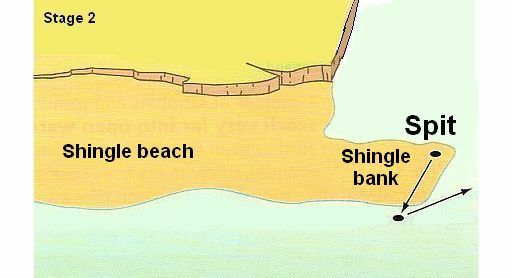 Longshore drift is the process by which material is carried along a beach. 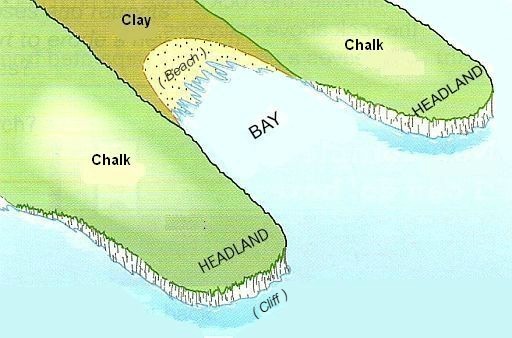 point B will deposit some of the sand as it runs out of energy (point C). this will also build up above sea level in time. ........... = een lange, smalle landtong. .......... • Fig. Formation of a spit (schoorwal ). Dit is een lange, smalle landtong. 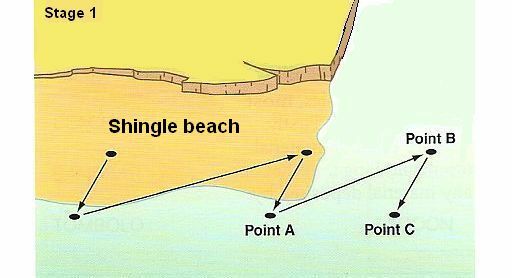 .......... • Shingle beach = kiezelstrand; shingle bank = kiezelwal. When this hapens, the coastal feature is called a bar (= Nehrung ). In time this will be filled in with wind-blown deposits, be colonised by vegetation and eventually become dry land. .......... join up with the beach on the other side. .........• Fig. Loe Bar, Cornwall. This is called a tombolo (tombolo). Tombolo (= Tombolo (Ned.) (= a bar extending out to an island). ........ • Fig. Tombolo in northern Scotland. 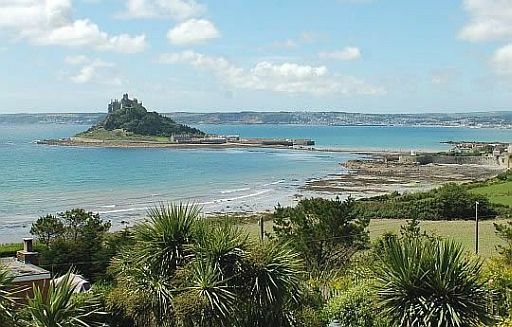 • The island St. Michael's Mount is also connected to the mainland by a tombolo. most spits do not reach very far into open water, for two reasons. up material from the sea bed. longshore drift before it can build up above sea level.